I have wanted to paint something in a big bold green for the longest time! So when the nice folks at General Finishes sent me this yummy Emerald Milk Paint I was thrilled. I've tried this paint before and I'm a big fan. Buttermilk Yellow, Lamp Black and Coastal Blue are three of my favorite colors. This milk paint is not a powder or even a true milk paint, but a water based acrylic. I love the way it goes on smoothly and levels out nicely - perfect for furniture. 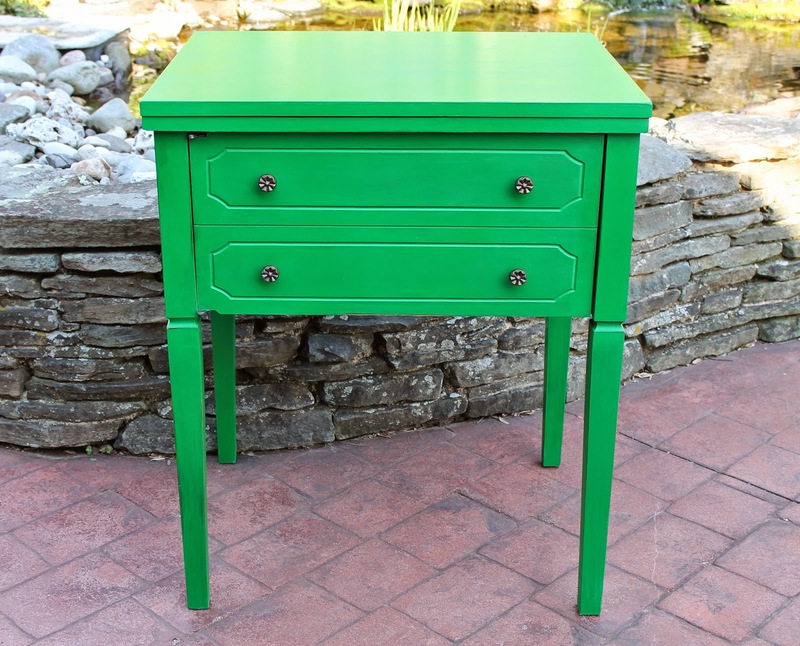 I thought this sewing machine cabinet was the perfect candidate for a big bold color. With their long legs, these cabinets are so versatile. They work especially well as nightstands with today's higher mattresses. Milk paint requires a minimum of prep work. You know the drill, a once over with a sanding sponge and a thorough cleaning with TSP. I also removed the sewing machine and glued down the lid to make the cabinet easier to handle. Those old sewing machines are really heavy! I loved the little knobs, so they were keepers! I finished this piece with a coat of Fiddes & Sons clear wax. So there you have it, big bold emerald green! Wouldn't this look great in a boy's room between twin beds with denim comforters and plaid sheets? Yes, as I'm painting I like to imagine where a piece might end up! Have you painted anything in a big bold color? Love your green! I have been going throughout a green period myself! Have a good weekend. Oh I love this color, and your new cabinet looks fabulous. This looks amazing...it's exactly the color I was thinking of for a small bookcase I have. I'll definitely be giving this paint (and color) a try!!! I just LOVE this little green table, and I think tucked between twin beds would be simply adorable! love it! i have a dresser i am almost done with in this color- it's so vibrant and fun! trying to get up the nerve to try something besides white. love your new look. My late mom's favourite colour! It looks lovely and so fresh. I saw in a store here where they took a sewing cabinet and added a plastic tub to fit the interior hole, painted for outdoors, added a bottle opener to the side and had a drink cooler for the backyard. The lady can't keep them in stock and has a hard time finding more cabinets. I am smitten with this color and the table. Great combination. I just received some paint from General Finishes as well. I just need to carve out the time to paint something. Lovin' the green! I painted a pie safe in almost the same colour green last year. It still makes me happy when I walk in and see it. I love how you are not afraid of bright, beautiful colors! This table was the perfect candidate for a bold green! Really great table for that color! I love the bright green - what a fun piece! I love the green, Sharon. It turned out fantastic. Oh I love this color Sharon! Perfect for a small piece and the vintage sewing table looks so fresh! What a great pop of color! Beautiful! I love the emerald green! Makes me want to watch "Oz, the Great and Powerful"! Beautiful Sharon! And it was the perfect piece for you to finally try your emerald green on. :) Thanks for linking up to Trash 2 Treasure Tuesday! love this makeover Sharon! catching you!